Was the performance by Braxton Miller and Ohio State a preview of what to expect throughout 2015? It was towards the tail-end of Ohio State’s 42-24 Labor Day Night win at Virginia Tech that ESPN put up a graphic showing the rest of the Buckeyes’ schedule and the % chance they had of losing each individual game the rest of the season. The worst rating that got was a 77% chance of winning against Michigan State. There’s been plenty of talk about what that means for the College Football Playoff (e.g., that Ohio State is a lock). What I want to do is look at what this might tell us for handicapping the rest of the Big Ten, particularly with Michigan State being in the spotlight this Saturday night at home against Oregon (8 PM ET, ABC). 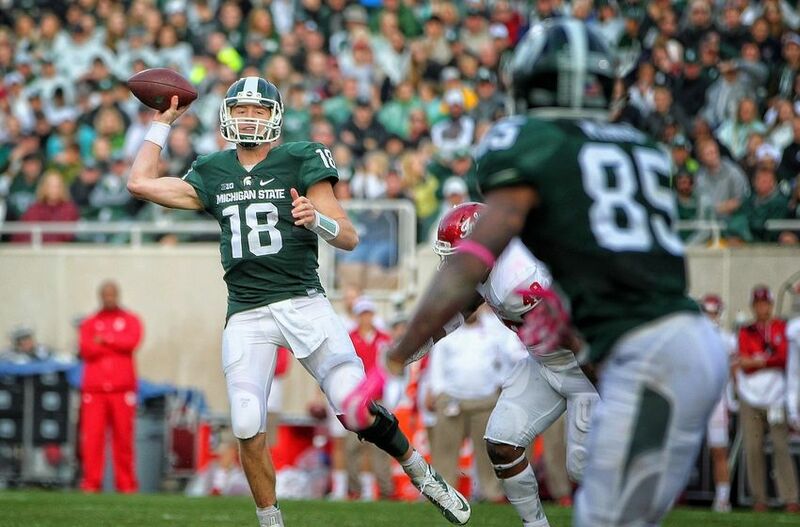 Put simply, is the Big Ten still prime “go-against” territory for handicappers in non-conference play? Let’s look at the record. 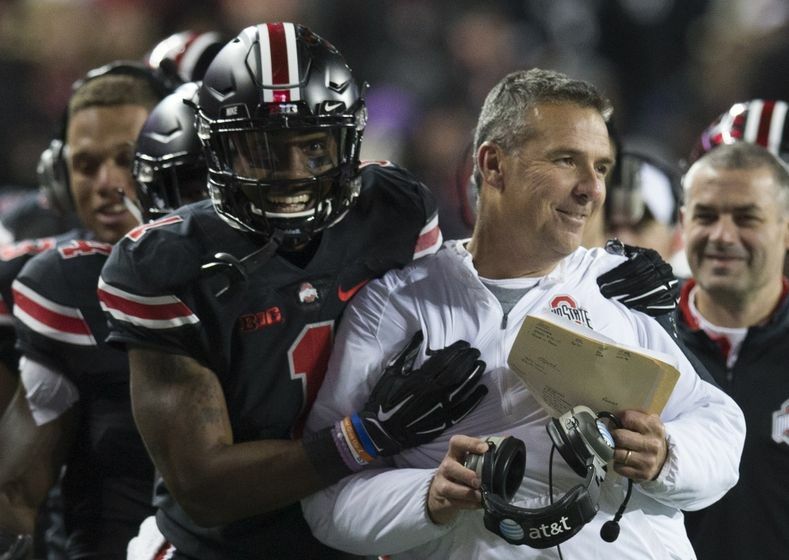 In Week 1, the 13 Big Ten teams not located in Columbus went 7-6 ATS (against the spread). That sounds good enough—in handicapping any number over 52.4% is enough to beat the house advantage and that record clocks in at 53.8%. But digging deeper showed some problems. Nebraska (-5) BYU 28-33—note that even had BYU’s desperation pass to win the game failed, the Cornhuskers would only have won 28-27 and thus failed to cover. When it comes to the football rivalry between the Michigan Wolverines and the Michigan State Spartans, some observers see it as Big Brother vs. Little Brother with the Wolverines cast as the big brother and the Spartans as the little brother. 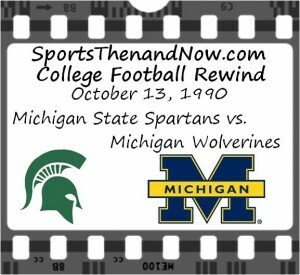 Heading into their 1990 meeting, Michigan had a confident feeling they were going to their little brother another beat down as the Wolverines entered the game as the #1 team in the country while Michigan State came in with a losing record. The 1990 season was the first season in 21 years that Michigan did not have legendary head coach Bo Schembechler roaming the sidelines. Gary Moeller, a Michigan assistant coach for 17 of Schembechler’s 21 years at Michigan, took over as head coach and guided the Wolverines to the #1 ranking despite a 28-24 loss to Notre Dame in the season opener. Michigan had an offense that featured running back Jon Vaughn, the nation’s leading rusher at with 168 yards per game, sophomore quarterback Elvis Grbac, and a sophomore wide receiver named Desmond Howard, who was starting to make a name for himself in college football. While the Wolverines came into the game as the top-ranked team in the country, the Spartans entered the game with a 1-2-1 record and were coming off a 12-7 loss to Iowa the week before. This was the eighth season for Michigan State with head coach George Perles as head coach, who had complied a 46-33-3 record in his first seven seasons and had taken the Spartans to a Rose Bowl victory following a 1987 Big Ten championship season. During the mid-1990s, the Ohio State Buckeyes had some great teams go through most of the regular season undefeated only to have their arch rival, the Michigan Wolverines, spoil the Buckeyes’ dreams of a national title on three occasions. But perhaps the Buckeyes’ most heartbreaking loss during this time period came at the hands of that other football team from Michigan. The 1998 season was the 11th season for John Cooper as the Ohio State head coach as he had complied an 86-32-4 record during his 10 years in Columbus. Despite his success, Cooper was not embraced by the Buckeye faithful as he had only defeated Michigan once in his first 10 meetings with the Wolverines and was 2-7 in bowl games. But in 1998, it appeared that the stars were lining up for Cooper and Ohio State to have a magical season. The Buckeyes began the season as the #1 team ranked in the country because of the 17 returning starters on offense and defense that included quarterback Joe Germaine, wide receiver David Boston, and linebacker Andy Kaztenmoyer. Through the first two months of the season, Ohio State was dominant as they won their first eight games of the season by a combined score of 306-72. As the Buckeyes entered the month of November, it appeared that their only obstacle would be arch-rival Michigan on the last game of the season in a game that would be played in Columbus. So as Ohio State entered their home game with Michigan State on November 7, 1998, it seemed the only question was by how many points would the Buckeyes win over the Spartans. It appeared that the Spartans were headed for another mediocre season under head coach Nick Saban, who had only gone 19-15-1 in his first three seasons in East Lansing, and were 4-4 at this point of the 1998 season.